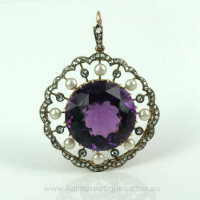 Product code: Q882 Categories: Sold Items, Sold Jewellery. Here is one of the most fabulous and elegant antique pendants that will certainly stand out and be admired every single time that it is worn. 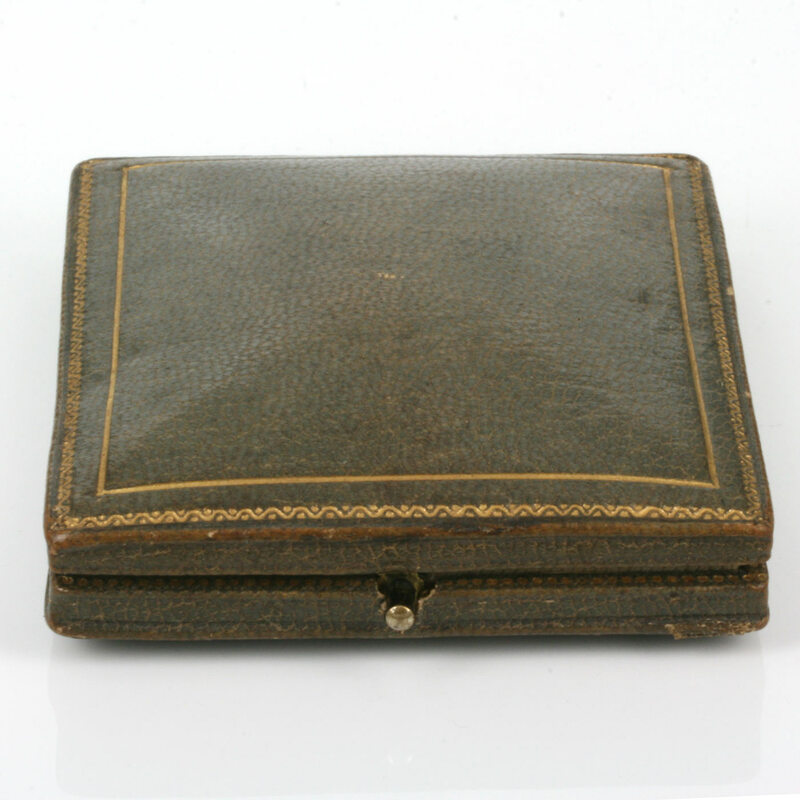 Hand made in 15ct gold and silver in the late Victorian era of the 1890’s, silver was used at this time as white gold was not yet invented and platinum was not used in jewellery until the start of the 20th Century. In the centre is the star of the show – a magnificent amethyst that measures 27.6 carats and has the most perfect purple to it. Surrounding the amethyst are 8 pearls and 8 rose cut diamonds, then surrounding this is the most incredible row of 72 more rose cut diamonds. Then on the top bail are a further 4 more rose cut diamonds to complete the piece. The diamonds total 1.00 carat and sparkle wonderfully in the light. Measuring 36.6mm across by 46.1mm to the top of the bail to the bottom, the fitting at the top allows it to be placed on a chain or even between pearls which makes such an impact statement. 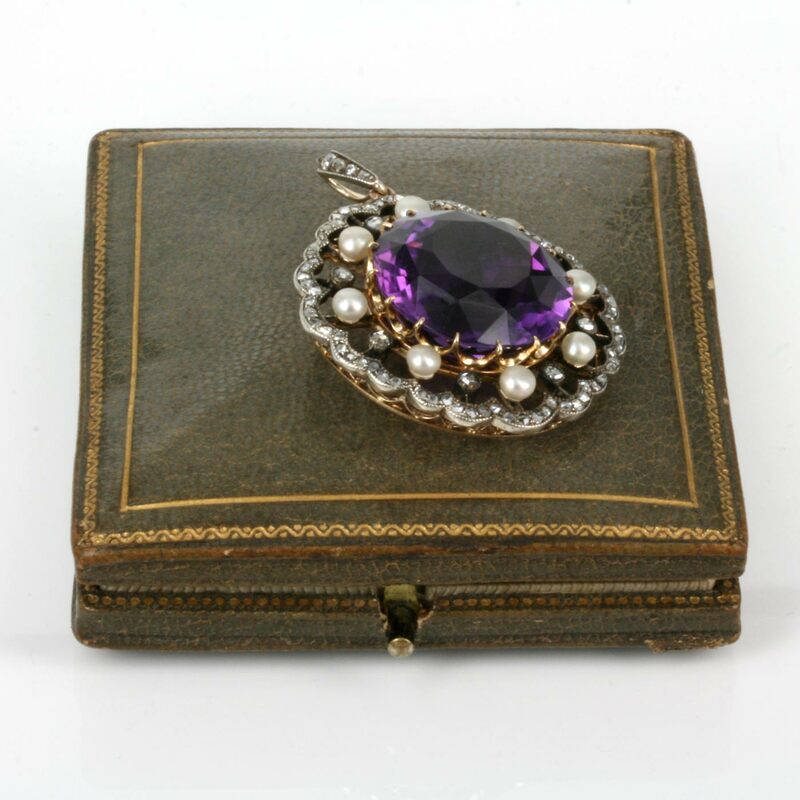 Fitted in its original velvet lined box, this is a remarkable late Victorian amethyst and diamond pendant that is simply sensational.